The body is a grizzled gray, with the extremities and tail darkening to black. The white facial goatee marking and rust colored crown are distinctive. About the Animal: First described in 1780, DeBrazzas monkeys are named for the Italian-French explorer, Pierre Savorgnan de Brazza. 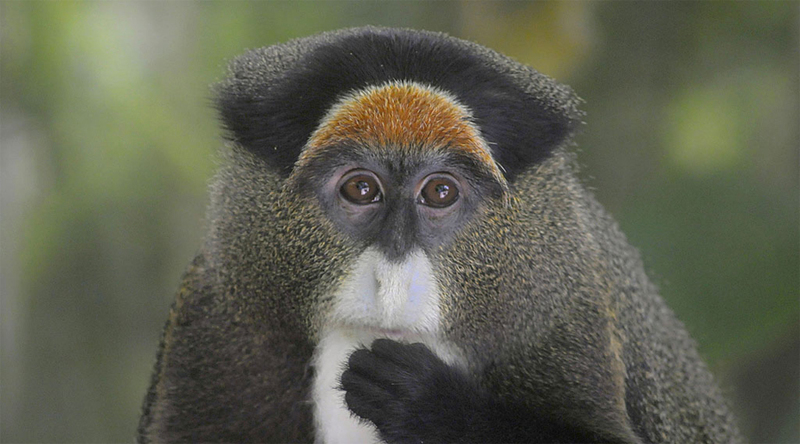 They belong to a group of Old World monkeys known as guenons. All monkeys in this group are diurnal and most spend a great deal of time in the trees. Most prefer to live along rivers and wetlands if possible. All have check pouches for carrying food from location to location. DeBrazzas monkeys are primarily arboreal, and usually live in small social groups led by the strongest male. Females will tend to stay with their natal group where males disperse upon reaching maturity. Mating and Reproduction: Breeding season classically falls during the months of February and March but if there is food available, this species will breed at any time. It takes about 5 years to reach maturity. Gestation is 5-6 months with a single offspring being born at the end. The young cling to the mothers’ fur. Youngsters nurse for nearly an entire year before weaning. Amazing Information: The scientific name ‘neglectus’, which means to pay little or no attention to, was given to DeBrazzas monkeys because of their amazing hiding ability. When frightened, they have been know sit absolutely still for hours before disappearing into the leaves.